The first few days of any photography trip are usually the most difficult. With new locations to explore, and sometimes jet lag to deal with the first few days should be a relaxed affair, but for me they are the exact opposite. I always feel compelled to capture something special early on, whether that’s a priority vista or just a colourful sunrise, to take the pressure off myself. Once that first winner is bagged, I can relax and start to really enjoy my photography. This trip was going to be no exception, and after looking at the forecast for sunrise I was already putting the pressure on myself to come back with something special. 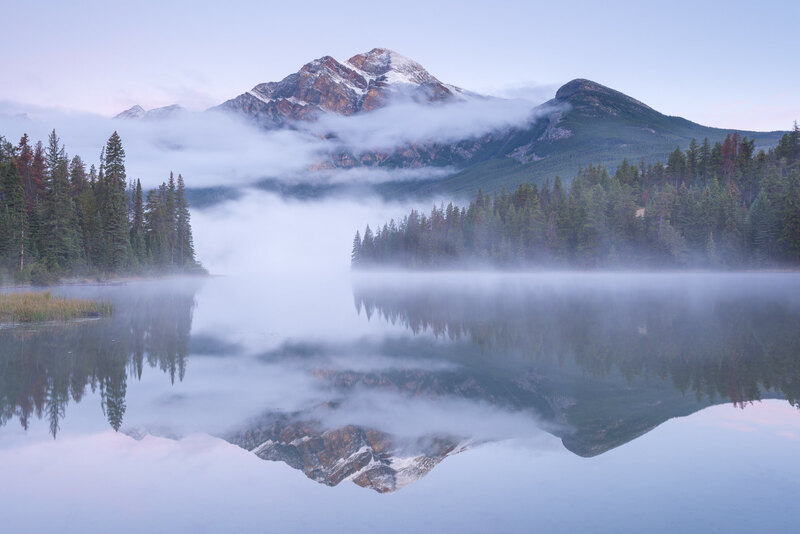 The calm, clear forecast suggested both reflections and hopefully some morning mist, so my colleague and I planned to shoot a lake for sunrise. 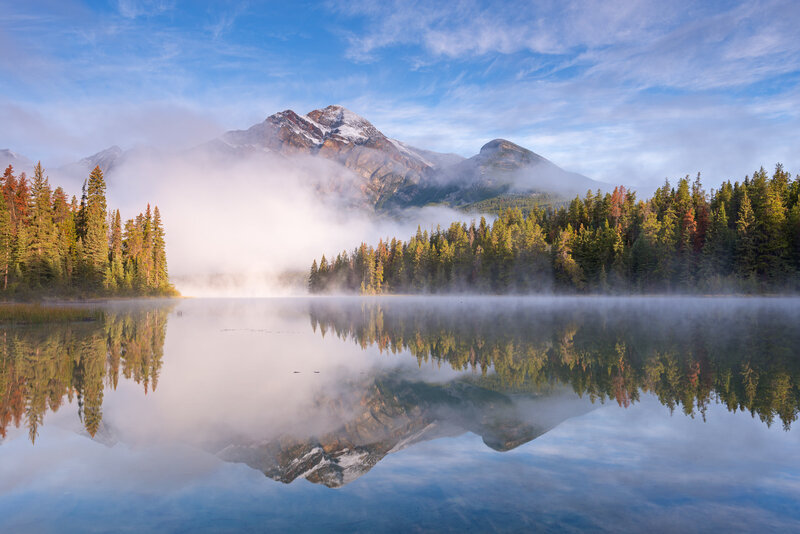 We were staying in Jasper National Park in the spectacular Canadian Rockies; with a plethora of beautiful lakes all around finding a suitable lake was no problem. We decided to visit the ever lovely Pyramid Lake together with its namesake mountain. However, on arrival at the lake side things didn’t look promising. The whole scene was choked with thick mist, an impenetrable wall of fog reducing visibility to almost nothing. On top of that the water was rippled and unreflective. Rubbish. Every now and again several photographers appeared through the murk presumably making the most of the conditions. I contemplated doing the same, that certainly would be the safe option, but it just didn’t feel right. 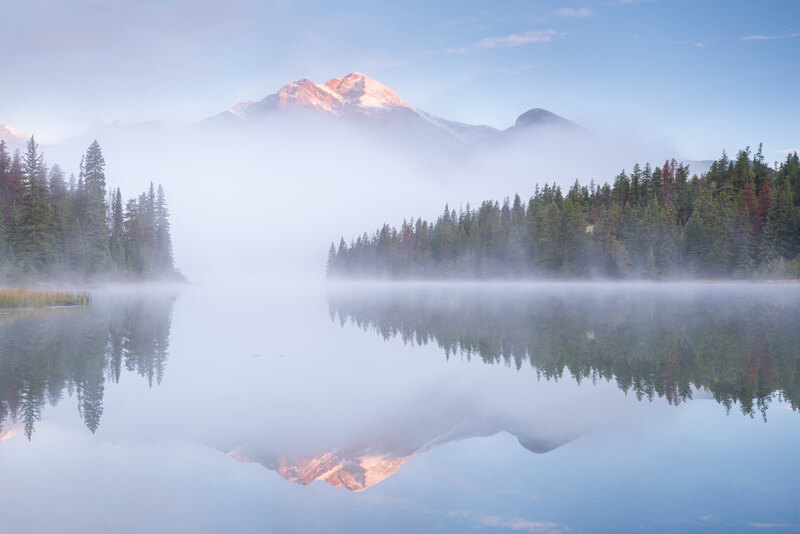 I hadn’t travelled thousands of miles to shoot a few trees through some fog; I planned to shoot Pyramid Mountain and was determined to try my best. The mist seemed very localized, so if I could get to the end of the lake I might be past the gloom and achieve views to the mountain. From a previous visit I knew this part of the lake was often sheltered, so with some good fortune I may find some reflections too. It seemed a long shot and time was running out, but my internal pressure cooker left me with no choice but to try! We had to act quickly; this new viewpoint required a fifteen minute walk that we hadn’t planned for. Setting off into the woods with my colleague, after just a few minutes I looked to my left and was thrilled to see the mountain top peaking through the mist. I walked faster, pulling ahead of my friend. Another look to my left, and I noticed with excitement the ripples had disappeared from the water! 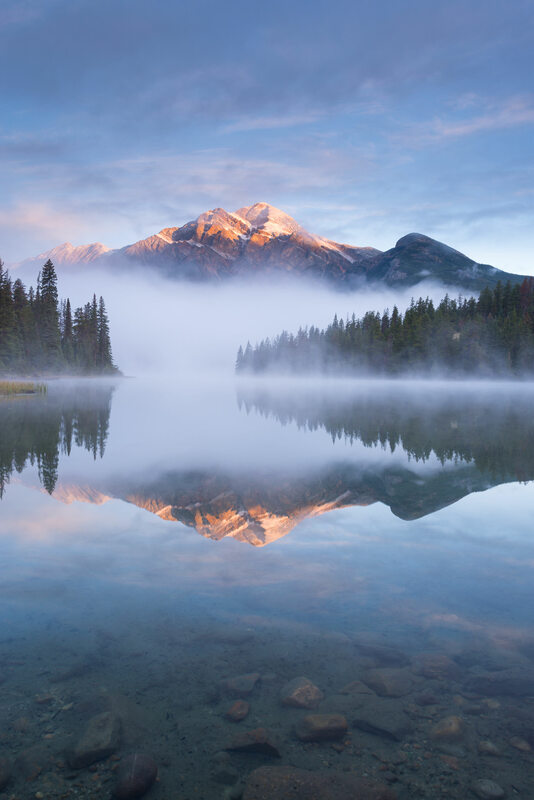 Could this be happening, were we about to witness the mountain, with reflections AND mist? I all but broke into a run, my colleague now out of sight somewhere far behind me in the dark woods. All of a sudden my mind turned to bears. The previous day we had been to this viewpoint, where my colleague pointed out some bear poo on the path. Now I was alone, in the dark, rushing towards that poo and possibly its owner! I briefly considered hanging back and waiting for backup, but then I looked to the left again. Oh my god, it was really happening! I was now past the mist, the far side of the lake was clear, and I could just about see the mountain. I knew I had only several minutes before the first light of the morning illuminated the mountain top, but I couldn’t quite see it from this position. I had to get to the corner of the lake, which offered a great vista back towards Pyramid Mountain. I pushed on with renewed speed; if there was a bear waiting for me around the corner then so be it, I simply had to get into position to shoot these incredible conditions. Just a couple of minutes later I was there. I raced to the shoreline and looked back over the most incredible view. 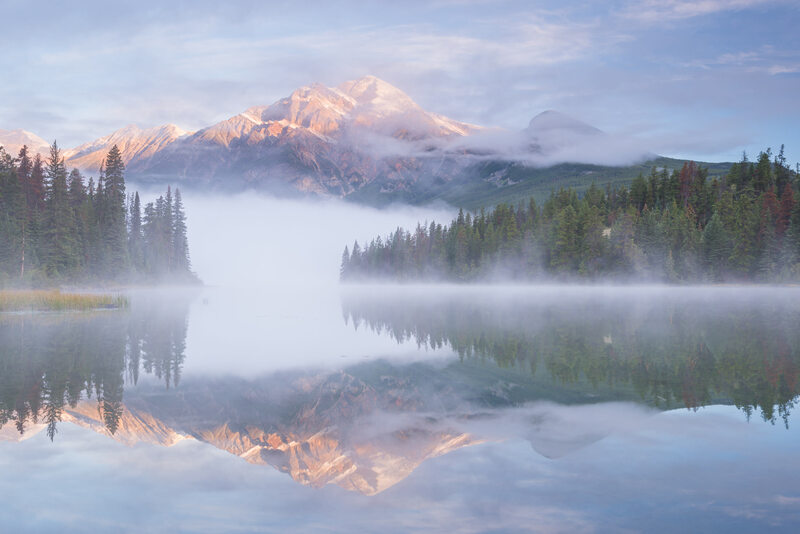 The conditions I had hoped for were now reality with the most breathtaking vista; a gorgeous mountain rising above floating mist, all reflected in perfectly still water. I was relieved and excited, my jet lag vanishing as I rushed to set up my gear. Minutes later, the mountain top was crested with a deep red glow from the sunrise. The only thing that could make this moment sweeter was for some clouds to appear in the clear sky, and within just a few minutes they arrived too! Over the next hour the conditions changed quite dramatically without ever losing their magic, and we were the only photographers there to capture them. An hour or so later, with time against us we reluctantly pulled ourselves away, and headed back to the car. When we arrived we were surprised to find the original planned viewpoint still choked with thick fog. After chatting to the photographers who were still milling around it seemed our morning of magic had eluded them completely. For them, there was no mountain, light or reflections, just a wall of mist. As we returned for breakfast, I felt a huge surge of satisfaction and relief. I had my first shots of the trip, and I knew they were special. Regardless of what we were presented with from this point, I would return home happy.